27 Apr 2018, 12:47 p.m.
Photo courtesy of the Deutsche Bundesbank. The exhibition, titled ‘Gold, Treasures at the Deutsche Bundesbank’ is being hosted at the German Money Museum, which is part of the Deutsche Bundesbank in Frankfurt. The display follows the return of half of Germany’s gold bullion from foreign vaults. 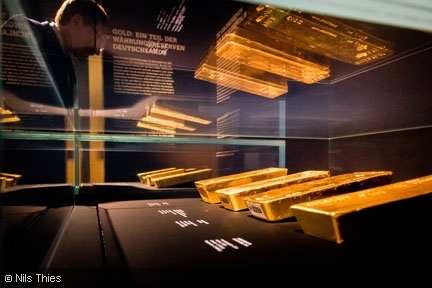 In an official statement from the Bundesbank, Executive Board member Carl-Ludwig Thiele said: “The selection ranges from the oldest to the newest gold bars and gives visitors a rare insight that’s normally prevented for security reasons. Photo courtesy of the Deutsche Bundesbank. Mr Thiele (right) with Alexander Ruske (Bundesbank numismatist, left) at the press launch of the exhibition. Pressure was mounting on the German government from the public and political opponents campaigning to ‘Bring home our gold’. Historically, German gold bullion had been stored abroad since the Cold War due to fears of Soviet invasion into then West Germany. 98% of their gold bullion was shipped to New York, London, and Paris. A leaked report in 2012 damned German banking officials for not adequately monitoring their gold bullion levels abroad, sparking fears that the host nations may have dipped into the funds themselves or siphoned off small quantities. The German government announced their plan to recall bullion in 2013, a process which has taken time to negotiate and plan for security reasons, though many argue that the Eurozone debt crisis was the driving force behind the recall. Germany’s bullion stockpile currently weighs around 3,400 tonnes – worth €117 billion in value – and is the second largest stockpile in the world behind the United States’ gold hoard. Of that total, half is now back in Germany, while part remains in London and 1,200 tonnes remains in New York. The vaults in Frankfurt with the Deutsche Bundesbank are the primary store of the nation’s bullion, though due to the volume of gold involved Berlin is hosting some of the bullion while Frankfurt’s vaults expand in capacity, work which is due to be completed in 2020. It is not known if the German authorities will request the remainder of their gold be returned at that point. The museum exhibition is open every day bar Saturdays from 9am to 5pm, with free admission. For more information click here.